Max bets are currently $250 for both Britt and Sophie, which gives a max loss of $450 and $1000 respectively. Can someone pls tell me if Sportsbet have a deal with channel 10 or do Sportsbet rely on spoilers/inside information? Curious if Britt is def F1? Have they ever Been wrong? @Loulou wrote: Can someone pls tell me if Sportsbet have a deal with channel 10 or do Sportsbet rely on spoilers/inside information? Curious if Britt is def F1? Have they ever Been wrong? Never. IMO they have one or more inside sources. It could be anyone - paparazzi, caterers, crew, make up artist, hotel staff - there would be so many people who know the result. It may even be TPTB themselves - who knows what kind of kickbacks they might have in place (tell us the winner so we don't lose a mint, and we'll let you place a higher bet...?). Sportsbet are in the business of making money - they're not going to risk losing profit just to avoid spoiling a TV show IMO. If they didn't know, the odds/max losses would be more "wishy washy". A clear winner means they're sure, IMO. Correct me if I am wrong but I believe there was actually a tweet in eithe Sophie or Marty’s season from The Bachelor account that even referred to Sportsbet. Two words - In.Bed. @Sundy wrote: Correct me if I am wrong but I believe there was actually a tweet in eithe Sophie or Marty’s season from The Bachelor account that even referred to Sportsbet. Two words - In.Bed. Yeah I remember that. TBH I think Sportsbet think the whole thing is a joke. They probably can't believe people are willing to bet on a race which has already been run and won. They even have a disclaimer saying the result is KNOWN - they can't lose! SB probably sent that text themselves to entice a few more bets. This show's like a license to print their own money. @LeapofFaith, original Britt is still favourite - the betting orgs seem to be taking advantage of gullible people by exploiting the fact that one of the intruders has the same name as the suspected F1. 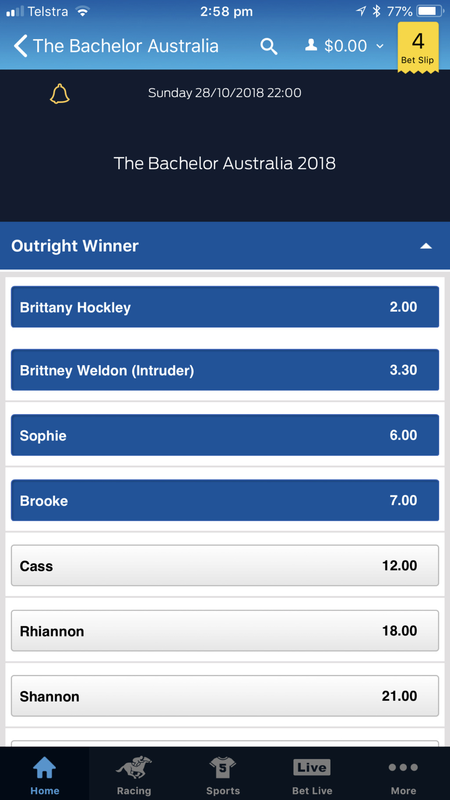 They make Britt 2.0s odds look like she could win so people rush to place bets. More bets drive the odds even lower and the cycle continues. Note to self: see if I can buy shares in Sportsbet. Interesting isn’t it. Might be nothing might be something. Could explain why Britt Sophie and Cass are so tight. Maybe they are F1, F3 and F4. I still suspect they are still in the order we thought though. What date do we have the intruders entering the mansion? @Sundy wrote: Interesting isn’t it. Might be nothing might be something. Could explain why Britt Sophie and Cass are so tight. Maybe they are F1, F3 and F4. I still suspect they are still in the order we thought though. What date do we have the intruders entering the mansion?